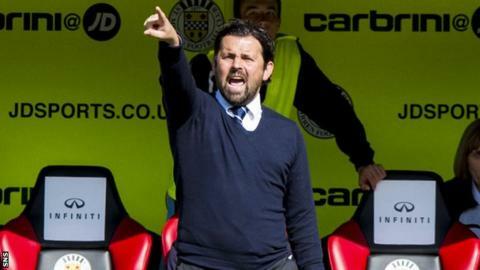 Dundee manager Paul Hartley felt his side's narrow 1-0 win against St Mirren in Paisley was a deserved result after a difficult match. Peter MacDonald came off the bench to score the only goal of the game and earn the Dark Blues their first league win of the season. "We're away from home and we had to grind out the result," said Hartley. "They had some good chances, our keeper had to make some great saves, but we'll take the three points." Dundee moved up to sixth place in the table after a string of draws in their opening three matches left them with only three points. Hartley insisted the level of quality from his players in recent games was of a higher standard than the win against St Mirren, but was reluctant to complain about the outcome. "I thought we worked hard, but I think we can play better in terms of our possession and passing of the ball," he explained. "We've maybe not had the results recently, but the performances have been good. "I thought this was our worst performance in terms of passing the ball and the intensity of our play, but we got the win and I think that's the vital thing. "We're working all the time and I think we'll get better - we've had a solid start to the season."